In the middle of the second century, St Polycarp, the bishop of Smyrna, a disciple of St John, stood before a council in Rome ready to be martyred. When given the opportunity to address his service to Christ and recant for those things which the officials found him worthy of death, the senior churchman answered, “Eighty and six years have I served him, and he has done me no wrong; how then can I blaspheme my King who saved me?” In one sense, this is another heroic story that we want to read to our children and motivate them to understand what real courage is, what special road some have walked for the cause of Christ, and what exceptional cost may be demanded of them. However, in another sense, this story is simply the outflow of what anyone, who follows Christ, could very well face. This story can be seen as no other, than the natural end for anyone who answers the call of Jesus to come follow him. It is rare for Luke (or any of the other gospel writers) to note that a great multitude of people were following Jesus, without Luke noting that Jesus’ next words were sure to drive many of them away. That is because Our Lord understands the level of commitment of those in the crowd, may not match that, which is required of a disciple. As you can imagine, in a crowd of great numbers, that there would be many following him for less than devout reasons. No doubt that many simply longed to be healed, watch others healed or witness any number of miracles. With crowds it is easy to blend in and just ride the wave of emotions and never make any kind of commitment to the Lord. Crowds grow exponentially because they provide a place for people to be a part of something that requires little to no commitment. It is a place where you can just blend in and take upon yourself the identity of the majority. It is a sad belief of mine that there are now many churches that are no longer congregations, just crowds. Obviously Jesus’ words here are a rhetorical device of hyperbole but that should not be a reason to soften the message. Jesus is not commanding bitter resentment towards our parents, spouse or children. He is not commanding the disposition of our hearts to be against people. In fact, He condemns such actions; in commanding us to love others even as we love ourselves. The Lord tells us that the relationship with him needs to be in an altogether different category far above and beyond every other relationship we have. He is literally saying to all that are listening, “if you are to be my disciple, I am to be the supreme devotion of your life” - our affection and allegiance to Him must be greater than our affection and allegiance to anyone or anything else. No sacrifice is too costly for Him. And Jesus then continues. Having ended his last statement focusing each individual on himself, he now throws a greater challenge, “Anyone who does not carry his cross and come after me cannot be my disciple.” There you have it – the sine qua non of discipleship. A disciple must make the ultimate sacrifice. I find it most insulting when people use this as a cultural euphemism for minor inconveniences? There’s no parking within the church compound or near the church. You have to park half a kilometre away. “What can I do? It’s my cross.” The mass has still not ended after the normal one hour mark which leaves us impatient and fidgeting. 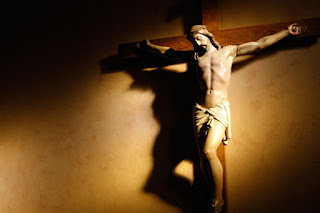 “This priest is really a cross!” Having to live with a shrew of a wife or an idiot of a husband, I see so many pronouncing their cheap martyrdom, “He’s (She’s) my cross.” This is certainly not what the Lord is talking about. Carrying a cross was literally a dead man walking, somebody who was convicted, condemned and on his way to death. You would have to carry your cross through the town to be humiliated, shamed and scorned. This is what Our Lord had undertaken. His disciple should expect no less! Unfortunately, we live in a consumer culture that has little understanding or appreciation of the cost of discipleship. It’s a culture that fosters and even encourages quitting. You don’t like this religion, then chose another. Your prayers don’t seem to be answered, so quit praying. You don’t like the Catholic Church because it’s so rigid and boring, go to that church that meets all your entertainment needs. You don’t like this priest, go search for another. Yes, in this consumer culture, you would find someone or something to give you what you want, but can’t guarantee that they will give you what you need. So many continually look for the path of least resistance. We fail to recognise that everything that matters is hard. Everything that matters is costly. For discipleship is not periodic volunteer work, on one’s own terms or at one’s convenience. As it is clear in the strong statements we find in today’s gospel, discipleship is total, unconditional, limitless commitment to Christ, requiring the greatest sacrifice, even to enduring suffering and death. Today, we are called to do an accounting of the sacrifices we need to make, and the cost we are required to pay for the price of authentic discipleship. We need to enter into the process of discipleship with a clear head and the intention of persevering, holding fast till the end. Throughout our lives we will be tempted to quit when suffering threatens us, when we face criticism, when the cost seems too heavy, when we receive neither reward nor encouragement. The importance of counting the cost of discipleship is apparent when we see that the point of our endeavour is to finish the race, not just merely to start it. Some say the hardest part is getting started. If this is true, why do we hear stories of people who give up on their diet, stop writing a novel or quit a difficult task at work. Maybe it’s not the start but the finish that’s so difficult. The goal should always be to finish, not just to start. And in order to finish, we must be prepared to pay the cost and make sacrifices. No reserves – sacrifice everything. No retreats – press on. No regrets – finish the race.